New Year, New You! That’s the famous slogan we hear every January. Some years we read this line and roll our eyes at the thought of working out, knowing you simply just have no time for it. Many people WANT to work out and stay fit, however their schedule doesn’t seem to allow it. But there are ways to get a workout in each day, even if it’s only 5 minutes! Here are some easy tips on how to fit a workout into your schedule on a day-to-day basis! Find a workout that you can do almost anywhere. Whether you are home from work late or traveling, there are exercises that doesn’t require much preparation. 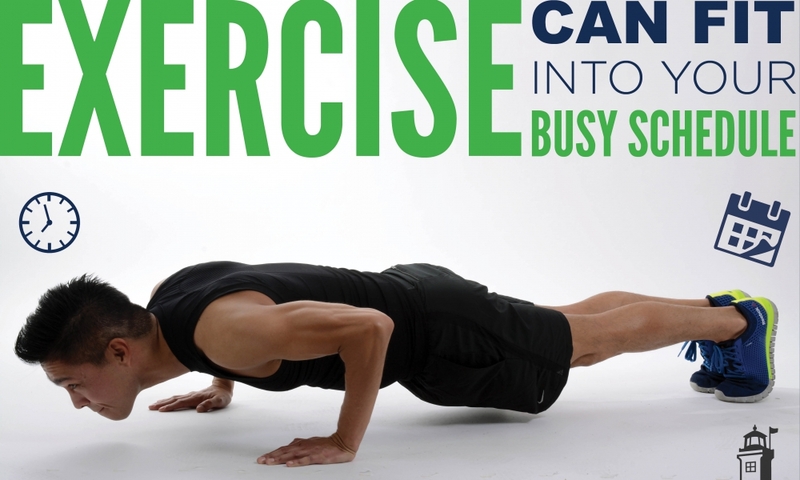 For example, bodyweight exercises (mountain climbers, pushups, plank, etc. ), and running are great examples. You can do most of these types of workouts at home, in your bedroom! It’s okay to not like certain exercises. You may be thinking “I hate running!” and it’s okay to hate running, many people do! You can substitute these workouts that you dislike without workouts that you may enjoy. One person’s running is another person’s Pilates, Zumba, or weight training. Don’t be so hard on yourself and choose a form of exercise that fits your lifestyle and personality. At the same time, don’t be afraid to experiment with different types of work outs. If you’ve never tried Zumba, give it a go! You may find out that you actually love it! Make A Plan And Commit To It! You may find yourself saying “I had a hard, long day at work and I am just too tired to work out” or I’m stuck at work and can’t make my next Pilates class”…these are not excuses! If your day is packed with work and other commitments, you can still find 5-10 minutes for yourself. Take a walk, or do a few planks…you will find the time in your day to do this! Work Out Around Your Busy House! If you’re a mother or father who spends much of their time with their children or doing chores at home, you may find it difficult to make time for exercise, but there is time! Let’s say you’re picking up toys to put away, while picking those toys up you can work out your legs and glutes by doing squats instead of bending at the waist. If you’re cooking dinner, you can do calf raises while standing at the counters. If you have a baby, you can pick them up and do a few overhead lifts, which I’m sure your child will enjoy also! If you have a toddler or teen, go outside with them and run around, or play a sport! Kids are a great partner to work out with! Think Positive and Stay Motivated!! If you start your days with any negative self-talk or thoughts, you’re starting your day on the wrong foot. If you catch yourself thinking “I am WAY too busy to work out” replace that thought with empowering thoughts such as “I am going to make it a priority to get a work out in today.” Tell yourself you are doing great, and to keep it up. Positive thoughts will begin to take over your negative thoughts, and when you start to see the results you are working towards, your negative thoughts will definitely disappear! So the next time you think that 24 hours a day just isn’t enough time to fit a work out in, remember that you are in control of your own calendar, the calendar does not control you! Stay positive, confident and motivated, and you will reach your fitness goals in no time!